excessively developed mounts, especially those of Moon and Lower Mars. Not the best mounts to dominate a hand. The Jupiter and Venus mounts are also developed. The Headline is weak, particularly in the first half his life, but this is not evident on his left, passive hand. The Heartline, though strong, is not long, and does not enter the Jupiter mount. The third phalanges are thick, the second phalanges are on the shorter side, and the first phalanges though not short, are broad. The logic (second) phalange of the thumb is thick. And there appears to be a line rising from the Headline, going towards the Heartline. You can take a look at one of his hand photographs here. If I didn't know this hand belonged to Sanjay Dutt, I would have said it belonged to a rough type of person, an aggressive person bent on satisfying his impulses, both mental and physical, even if it meant having to roughshod over others. I would say it was the hand of a person with volatile emotions and someone who was blunt. Certainly not an easy person to get along with, because there would be issues with logical thinking. The pushiness shown on this hand could override reason, especially when emotions are aroused. This was the hand of a person who is difficult to reason with. 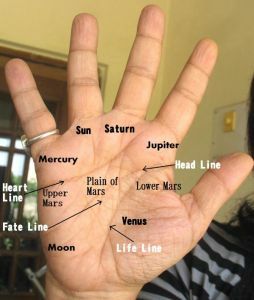 And then, if after reading all this, I was told that this was the hand of Sanjay Dutt, then I would say that he is lucky to have been born to Suneel Dutt. If he had been born in an unknown, ordinary family his personality could have landed him in bigger trouble. He was lucky because he had a name, a career and a life to get back to. It probably saved him. Sanjay Dutt's hand shows that he has a well-developed imagination, a creative side, moodiness, and intense feelings, but poor impulse control. It is likely that something in his upbringing, something in his childhood, changed him for the worse. He was born with strong emotions but he was also likely born with better self-control. And here are the hand readings of female Bollywood stars like Deepika Padukone, Alia Bhatt, Kangana Ranaut, Rani Mukerji, Bipasha Basu, Kareena Kapoor, Aishwarya Rai and Katrina Kaif. You can always check out the hand analysis of all other Bollywood actors on this website, and also actors from Hollywood. Can you please do Pink actor taapsee pannu? Wonderful actress! I will check if her hand photos are available. If they are, then certainly. Hi Nita, can you please do a reading of Mata Amritanandamayi and also the hand of Mohan Lal. Will check to see if their hand photos are available.